Dose Market is hip. Dose Market is stylish. Dose Market is tasty. Dose Market is it. Once a month, Chicago’s most creative minds convene at the River East Arts Center to share in the latest trends in food and fashion. 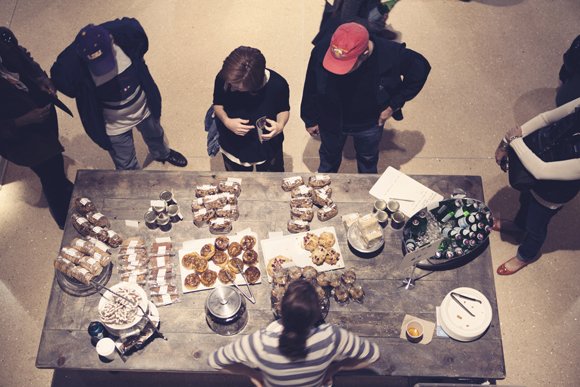 Welcoming about 45 vendors a month, the public is invited to see what’s new in Chicago. Curated by four fashion forward women, Dose is the place to be seen. My first Dose experience was on October 16th, and it was absolutely amazing. Walking into the River East Arts Center, you are able to peer over the railing and get a glimpse of all of the excitement on the floor. Walking down the stairs, I gladly received an immediate sensory overload. I was not sure whether I should stop to take pictures of the dapper young men that were shopping around, or indulge in a sticky bun from Floriole. I was even more thrilled to run into Klayton Korver from Seer Outfitters which was the Dose Cause of the month. All proceeds from the Seer Outfitters clothing line go to fund projects through the Kyle Korver Foundation. Cute clothes for a great cause, the perfect excuse to shop. Caroline spent much of her time gawking at vintage clothes. Story of her life. Our favorite designs were probably from the Chicago born, New York City based designer Samantha Sleeper (those are her designs in the background of this blog). This dress almost made us die. To sum it all up, Dose Market is a great way to spend a Sunday afternoon; who wouldn't love to rub elbows with Chicago’s food and fashion elite?! A germaphobe. But we are not germaphobes, and we love rubbing elbows with people. Be sure to find us at the next Dose on December 4th, can’t wait to see you there!